3 Easy Tips For Your Home Garden! Although it may seem difficult, growing your own vegetables really doesn’t have to be that hard. We hope to show everyone how feasible it is to try your own hand at gardening. Here are three basic tips to use with some easy vegetables: tomatoes and bell peppers. Plant tomatoes and basil or tomatoes and marigolds together. They are great companion plants. That means they attract the right insects, keep others away, and help provide nutrients and support for each other – just like a good marriage! Make sure to let your orange, red, and yellow bell peppers turn on the vine. They won’t turn after they are picked. 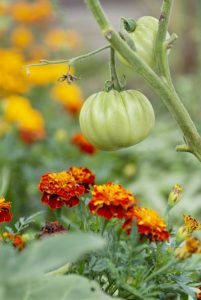 When growing tomatoes, monitor your flower clusters. Pinch off excess flowers so there are around 5 flowers per cluster – your tomatoes will grow bigger! We hope these guidelines can help you improve—or even start—your gardening efforts. Happy planting!